For the third consecutive year, the United States Sports Academy has been named a Military Friendly School by G.I. Jobs, the premier magazine for military personnel transitioning into civilian life. The 2012 Military Friendly Schools list honors the top 20 percent of colleges, universities and trade schools that are doing the most to embrace America’s military service members and veterans as students. The Academy, also known as America’s Sports University, slashed its tuition in its upper-division bachelor’s degrees by nearly one-third for active-duty military men and women and those in the “Wounded Warrior” program in July. The university has a long history of being military friendly, helping many service men and women earn degrees and certifications online, even while serving in Iraq or Afghanistan. The Academy’s bachelor’s program is regionally accredited. In addition, it offers several credit-bearing, non-degree courses in its Department of Professional Studies. These programs range from sports security and coaching to personal training and wellness. The 1,518 colleges, universities and trade schools on this year’s list prioritize the recruitment of students with military experience. These schools are making the grade by offering scholarships and discounts, veterans’ clubs, full-time staff, military credit and other services to those who served. 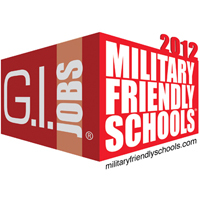 The 2012 list of Military Friendly Schools® was compiled through extensive research and a data driven survey of more than 8,000 schools nationwide. Methodology, criteria and weighting for the list were developed with the assistance of an Academic Advisory Board (AAB) consisting of educators from schools across the country. A full list of board members can be found at http://militaryfriendlyschools.com/Article/advisory-board/. A full story and detailed list of Military Friendly Schools ® will be highlighted in the annual Guide to Military Friendly Schools and on a poster, both of which will be distributed to hundreds of thousands of active and former military personnel in early October. The newly redesigned website, found at www.militaryfriendlyschools.com, features the list, interactive tools and search functionality to assist military veterans with their school decisions. The site was recently updated with the 2012 list.